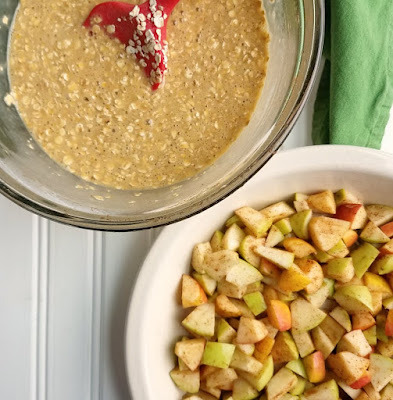 This fun breakfast has the flavors of apple pie baked right into a nutritious oatmeal package. It is easy to make and the leftovers are great too! I originally made this recipe in the fall of 2015. I was just dipping my toes into what was going to grow into a baked oatmeal obsession. Little did I know I would spend the next few years developing all kinds of healthier dessert inspired recipes. I haven't heard any complaints around here yet! MiMi especially likes the baked oatmeal inspiration. She was here when I made the first batch and she has been making it ever since. The pictures from way back when were less that appealing. I certainly still have a long way to go, but I figured I would use getting new pictures as an excuse to bake up another batch. Beside I had just loaded up on apples and want to make the best of them while they are in season. I just love apple season! Now I will take you back to the original post from the fall of 2015. Can you tell we like our oatmeal around here? Little Dude asks for it all of the time knowing he will get to help make it. This time we made an apple pie inspired version. I cubed some apples and tossed them in cinnamon, cloves and lemon juice. We spread them in the bottom of a pie plate and went to work on the oatmeal portion. Original from 2015. I just couldn't take it out! Little Dude dutifully got the oatmeal ready to go. We spread it over the apples and tossed it in the oven. When it came out there were delicious flavorful apples covered in a soft oatmeal layer with a crunch top crust. It was perfect. We ate some plain and some with yogurt on top. Both ways were wonderful. It was a fun way to welcome in apple season and fall! Too bad it just went back to being hot and humid! Baked oatmeal is great reheated, so don't be afraid you won't be able to eat it all. You don't even have to wait for company to enjoy the flavors of apple pie! Stir together apples, lemon juice, cinnamon and cloves. Spread on the bottom of a greased pie plate. In a mixing bowl, stir together eggs, syrup, yogurt and vanilla until well combined. Add oatmeal, salt, baking powder and cinnamon and stir until completely incorporated. Spread over apple mixture in the pie plate. Bake for 40-45 minutes or until set. I have been waiting for this one. So glad it's here. You made that just before I got to your house to hang out with Jaxon. It smelled so good while it was baking. Jaxon loved eating it but he brought that wonderful scent with him all morning. That should be a cologne. I take that back. That wonderful smell made me hungry all morning. He did take a little with him on his jacket! He had a lot of fun that morning. A perfect way to have a little extra special time before I had to go out of town! 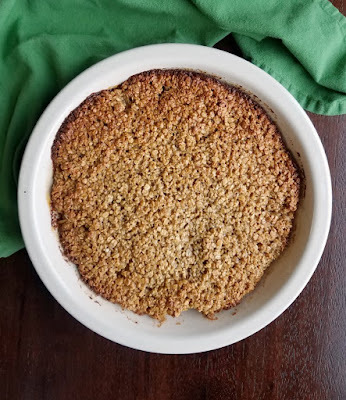 I think I'm going to adapt our family apple pie recipe with this oatmeal crust concept. Thanks for the great idea! What a great idea! You'll have to let me know how it goes! Thanks for following me on bloglovin! I am following you back. I love how apple pie recipe! 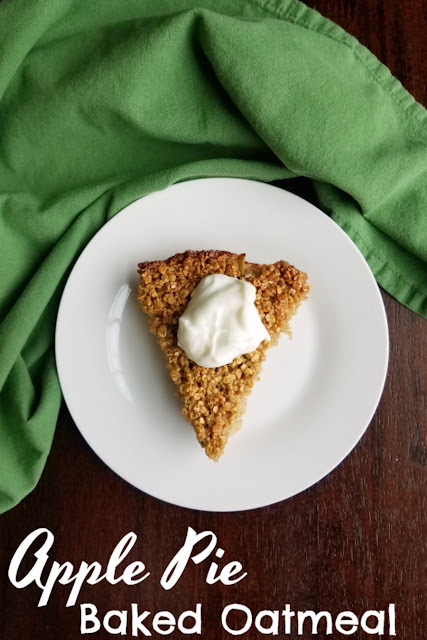 I co-host a blog party on Monday's called Cooking and Crafting with J & J.
I would love to have you join and share this recipe with us. Thank you! I will definitely stop by! 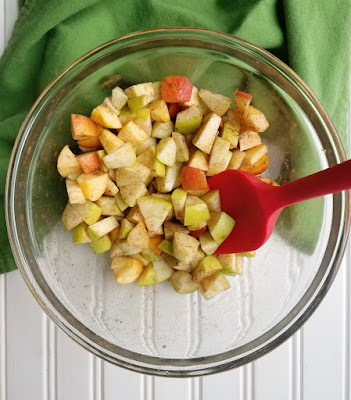 Thanks for sharing this apple recipe at Cooking and Crafting with J & J.
I am pinning this to try sometime soon. Mmm girl this looks awesome. I've been tossing around the idea of making oatmeal. Of course since I'm a banana addict I've been wanting that but this makes me smile so much. Nummmm. We have been loving our oatmeal. My mom made a really good banana bread baked oatmeal when my grandparents were in town... so maybe you could start with something like that!! YUMMY! This looks so delicious! How cool! So far Jax really likes to help in the kitchen! Thanks for stopping by. I see you have your assistant again in this recipe! Love the combo of apple and oats great breakfast! Thanks for sharing Carlee at #AnythingGoes and see you next week. He is such a good helper and it is hard to not stick a picture of him in when I can. Sometimes he loves it and sometimes he just wants to get down to business and doesn't want to worry about being photographed! Thanks for hosting, see you next week! This sounds really good! I'd love to try it. Thanks for sharing at Inspiration Thursday! Have a great weekend! So good and healthy to boot! 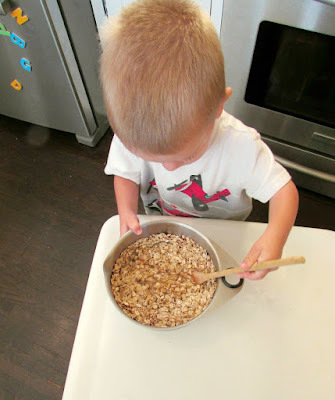 Apple pie oatmeal is a favourite in this house! Delicious! It is a favorite here too. We have a lot of fun making our oatmeal. Thank you! It really was both easy and delicious. We have really been enjoying experimenting with our oatmeal lately! Thanks for stopping by! Oh this looks yummy!! Thanks for sharing on My 2 Favorite Things on Thursday!! Hope to see you again this week!! I pinned this to My 2 Favorite Things Pinterest Board! Hi, Carlee ~ Mmm, this looks amazing! And I love apples and oatmeal, so it's a perfect combo for me. :0) Thanks for sharing with us at the Merry Monday Link Party! I'm pinning this so I can make it at home! Thank you! I think it is a fun and healthy fall treat. I made this for breakfast for my Valentine. I actually baked it yesterday on my wood stove. My home smelled so good I couldn't wait to reheat and eat it this morning. I sprinkled some toasted chopped almonds on top during the last few minutes of baking. My Valentine and I really enjoyed it. Thank you for the great recipe. You have the best baked oatmeal recipes. This is the perfect start to those cold mornings that we will soon be having. Thanks for sharing. It is warm and cozy, that is for sure. Thank you! Yum! I love that this baked oatmeal isn't all lumpy and gooey...two of the things I hate most about oatmeal! I'm all about the crunch! 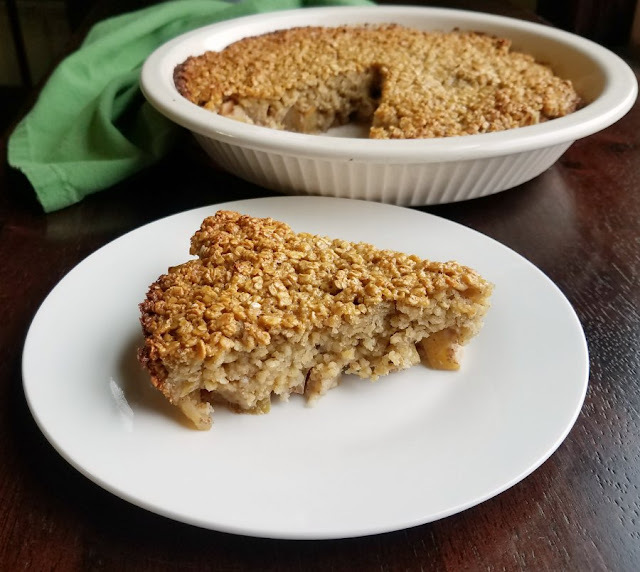 Baked oatmeal is one of my absolute favorite ways to have oatmeal! 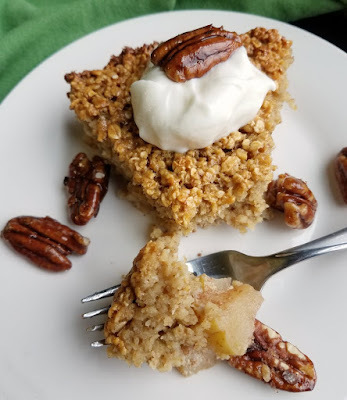 Apple sheet cake sounds pretty good too! The fall flavors sound delicious in this breakfast oatmeal. Seems a little sweet but not too much. It's not overly sweet, just enough and soooo good! This looks delicious! I'm also a bit of a baked oatmeal fanatic and an apple fanatic! We have a bushel that need used, so I think this will be on our breakfast menu soon. This will be perfect then! I hope you love it! Me too and baked oatmeal definitely has my heart, especially this time of year! This would be amazing for getting oatmeal into the kids. Just tell them you're having apple pie for breakfast! That would work for me too! This is such a good idea, Combining to favorites into one! Yummy! This sounds like a delicious breakfast. I love the picture of your son helping. SO sweet. Thank you so much for sharing with us at the Whimsical Wednesdays Link Party and have a wonderful week! He is such a good helper and has always been! Thank you! This sounds so comforting, Carlee! What a wonderful breakfast treat. It really is, Kitty! Thank you! Your post is featured on Full Plate Thursday this week and thanks so much for sharing it with us! Hope you are having a great week and come back to see us soon!